This throttle was designed as ideal complement to the command station and model railway PC programs. It offers intuitive operation, modularity and a lot of connectivity. Now you may ask (rightly), is DIY worthwhile at this point? Counter question: what is 'worthwhile'? Considered from a purely economic standpoint, DIY is of no interest, there are eg inexpensive mice from the starter kits. 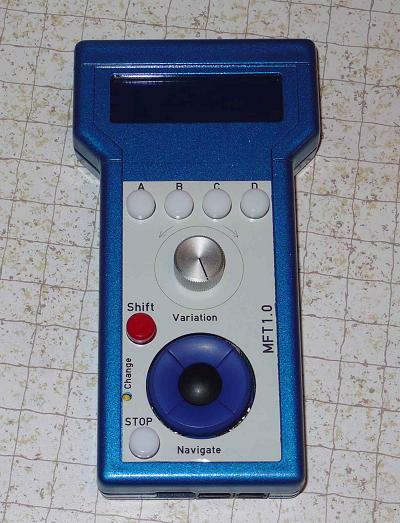 The project was started to create a better handheld controller and to get access to functions that of-the-shelf devices do not offer: eg Pom-Read (Railcom), seamless and smooth takeover of locomotives, controlling a decoder with dcc extended accessory command set or enjoy the operation with a really good rotary encoders (and not with a shaky potentiometer). 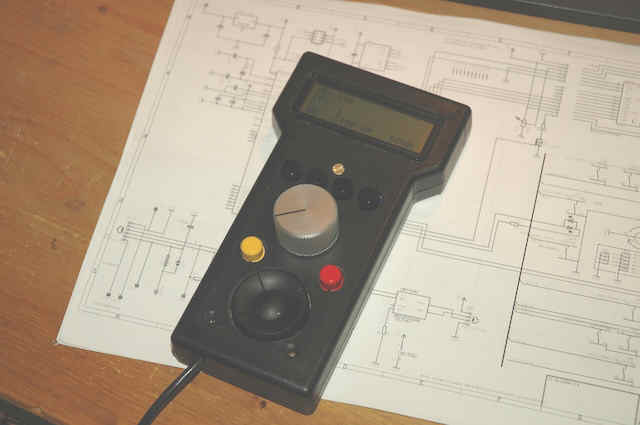 Moreover, a open-source based system offers the chance ot implement new ideas - like a configuration menu for the command station, a comfortable programming menu or accelerated clock for the layout, which is displayed on the handheld. 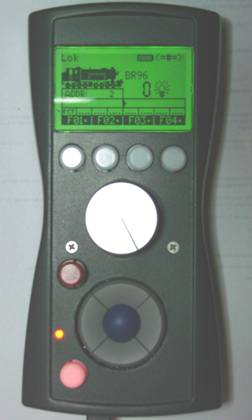 In conjunction with Rocrail the direct control of the PC software is possible, with the handheld still connected to the digital system - only the mode is changed. Moreover, even DIY enables variations, such as installation on a panel or building a 'drivers stand (cab)'. Power Supply Powered by internal Li-Ion battery or via a cable. The integrated battery is automatically recharged when the handheld is cable operated. The handhald consists of one board, display and an optional battery pack is attached to this PCB. The buttons and all IO connectors are directly mounted on the board. The board is only 52 x 100mm in size and utilizes SMD technology. The 'heart' is a fully integrated microcontroller, which already contains the necessary peripheral interfaces. 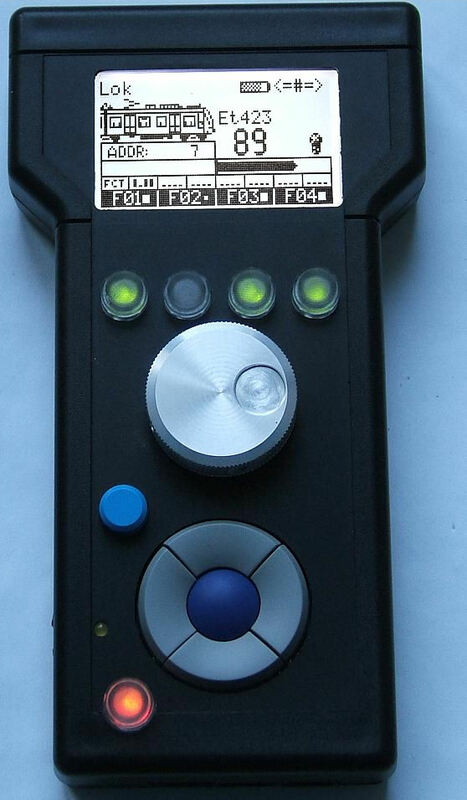 The buttons do have a 'real' pressure point, thus giving tactile feedback and allowing for blind operation. The rotary encoder is equipped with an intelligent function for acceleration, so both sensitive operation is possible as well as using locomotives with 128 speed isn't a nightmare. Keys and display are lit and the brightness can be adjusted. The lit emergency stop button is configurable by the user: you can choose between a complete shutdown of the system, a stop of all locos and a selective stop of the locomotives controlled by the throttle. The software is written entirely in C and is available on request as source code. An simple update of the software of the controller can be performed through the USB interface. The circuitry allows various alternatives and options, especially regarding power supply and display. Displays with 4-bit data bus or SPI bus can be connected. Currently a character display with 4*20 char and a graphics display with 128x64 pixels (recommended) is supported. The hand controller is not a development from me alone - I would like to thank J.M. Fischer for the rapid implementation of software ideas, M. Schwarzer for many hints and stimulating discussions, and F. Hahn for hardware commissioning, testing, and error messages and photos.